Lizhong Chen is an assistant professor in the School of Electrical Engineering and Computer Science at Oregon State University (starting in January 2015). 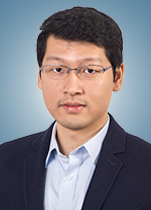 His research interests are in the area of architecture, application and emerging technology of computing systems, including embedded and mobile devices, many-core processors, data centers and high performance computing systems. Prior to join Oregon State University, he was a postdoctoral research associate at the University of Southern California (USC), working with Timothy Pinkston and Massoud Pedram. He is a member of the IEEE Computer Society and the Association for Computing Machinery (ACM). Chen received his Ph.D. in computer engineering and M.S. in electrical engineering from USC in 2014 and 2011, respectively (advisor: Timothy Pinkston). He received his B.S. in electrical engineering from Zhejiang University in 2009 and was part of the SoC team in the Institute of VLSI Design. He is the recipient of the Chu Kochen Award (the highest honor in Zhejiang University), the USC Ph.D. Achievement Award nomination, the National Scholarship from the Ministry of Education of China, and the Chinese Government Award for Outstanding Students Studying Abroad. The STAR Lab focuses on the research, development and educational endeavors in the broad area of computing systems. We perform cutting-edge research on a variety of system technologies and architectures to improve the performance, energy-efficiency, reliability and security of computing systems across a growing landscape, from embedded/mobile devices to supercomputers and data-centers.